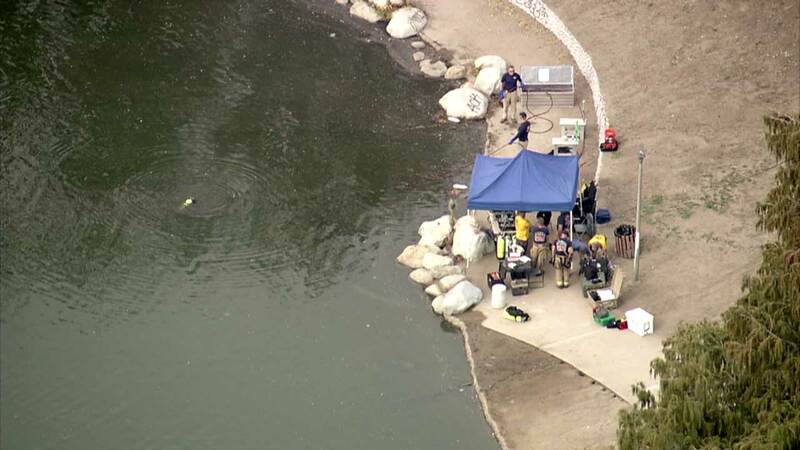 SAN BERNARDINO, CA -- An FBI dive team is searching Seccombe Lake Park, just a few miles away from the site of the San Bernardino mass shooting. Eyewitness News has learned the search is related to the attack. What the agents are searching for was not immediately known. The park is a few miles north of the Inland Regional Center. Fourteen people were killed and 21 others were injured last Wednesday when Syed Farook and his wife Tashfeen Malik opened fire during a holiday banquet hosted by Farook's co-workers with the county health department. Farook, 28, and Malik, 29, were killed hours later in a shootout with police, leaving behind a 6-month-old daughter. FBI Director James Comey told the Senate Judiciary Committee on Wednesday that the two were radicalized well before Malik came to the U.S. on a fiance visa and they had discussed jihad and martyrdom as early as 2013.